Indulge yourself in Spa-quality with Tropical Body Wash! 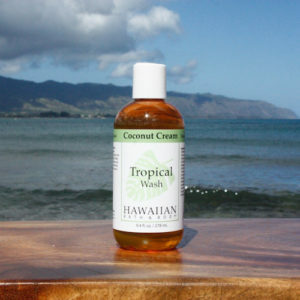 HAWAIIAN BATH & BODY has created an All Natural Tropical Treat to cleanse skin. Coconut Creme Body Wash is a yummy, creamy wash with an extra dollop of that tropical coconut fragrance we all know and love. Coconut fragrance makes this body wash a soothing tropical experience, a touch of Sweet Vanilla brings out it’s sweet side. 9.6 fl. oz. Handcrafted with Aloha, using the finest natural ingredients! KUKUI NUT OIL was used by Hawaiians for centuries to help with problematic skin. Kukui Nut oil is rich in vitamins A, E, C and essential fatty acids. For more about the traditional use of kukui nut oil, click here.